The Blade® engineers are taking their knowledge of heli design to the aerial video market with the 350 QX. 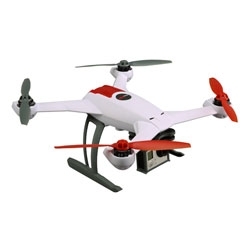 This highly capable quadcopter features dynamic flight modes that enable stable video capture from an included GoPro®-compatible camera mount. With the 350 QX, novices and experts alike can get involved in this exciting hobby with Ready-to-Fly and Bind-N-Fly® models available upon release. *Designed for use with GOPRO® products. GOPRO® is a registered trademark of Woodman Labs, Inc. in the United States and other countries. Nothing! Everything you need to get in the air is included*.